Army Red or Blue....or Green or Brown? I have been giving a lot of thought to the matters detailed in my previous post and think I may have come up with something very viable. At this stage I will not go into details as I have yet to finalise the plans but suffice it to say I will be posting the results in due course. In the meantime though, I need to scratch a particular itch. Again, sorry to be mysterious but I want to keep this under wraps whilst I finish the models in question. I currently have around 50 underway and it is very much in the nature of an experiment but if it works out it will have a profound influence on what follows. Jutland has not been neglected and I have at last sorted out want I will need for the respective fleets in terms of cruisers and destroyers. It actually is not too bad and so I shold be able to get the order to Panzerschiffe in one fell swoop although I will also need a coule of pieces from C in C as well. I am pretty set in terms of the rules I will be using for the refight - all I need to do is to adapt and test them. So as usual there is a lot 'bubbling under' and all will be revealed in due course. "There are those who raise Armies carefully designed to represent actual units and formations. This is not without disadvantages. Having failed to attain command of the corps it may be a consolation to include one's old Regiment in the Order of Battle, but it is perhaps safer to concentrate on forces of mythical powers. It will save endless arguements as to the impossibility of the Umpteenth Foot ever being routed and so on. And besides if you have any flair for military millinery it leaves you to exercise your own inventive powers in designing uniforms, colours, standards and all the panoply of military life in a more ceremonious age." I don't know if it is just me but whilst many gamers are happy to to design fictitious armies for the 18th century - and I should qualify that by meaning to the extent that they design the "uniforms, colours, standards and all the panoply of military life" - the 19th century is by comparison relatively poorly served. What I have seen though are many gamers using historical armies in an imagi-nation setting. To my mind this is not quite the same thing as what the good Brig and the Lt. Col. intended so I wonder what readers thoughts are? I should point out that in my opinion gamers should be able to tackle their chosen period in whatever fashion they desire but it did cross my mind about the uniform aspect. Why not design uniforms using historical models for your own armies - be they set during the Wars of Napoleon or any of the other campaigns during the 19th century? I have given this some thought on and off for some time now and have made a point of studying, for want of a better expression, military 'fashion'. In its simplest form you could say that there are three periods up to around about 1870 or thereabouts. I call these the 'tricorne' period followed by the 'shako' period and finishing with the 'kepi'. I realise that the Prussian style helmet was also influential and I would include this as following the kepi. In each case of course there would the inevitable overlap. Whilst the tricorne was pretty much the same whichever army you served - usually the level of lace or cockades being the only difference the shako was a little less standardised. In my opinion the bell topped version was the most common type and so any troops thus attired could serve for pretty much anybody at one stage or another. Similarly with the kepi. One could also extend this to the Prussian style helmet. My point is that for the most part figures in the requisite headgear could serve in any number of armies, regardless of national affiliation and therein lies the attraction when designing ones own forces. Selecting a suitable attired figure for the 'era' and then designing the uniform colours should be easy enough and there are certainly mainly smaller and less well known armies that could provide additional inspiration if needed. Going down this path certainly opens many avenues as one could utilise the best figures (and I mean that from the perspective of uniform styling rather than casting detail) to form ones miniature forces. The title of this post of course refers to that staple of military maps and professional training - the concept of the blue army and the red army. These alone could provide the basis for a pair of matching opponents (and have indeed done so) with the main uniform colour of red or blue reflecting the affiliation of the force in question. This is leading somewhere - I just have to decide where that somewhere is! The cover is a still from the film Waterloo which, despite my enthusiasm for the campaign I did not get to see until came out on Video. I have NEVER seen this film on the big screen! The picture is also of the softback version. 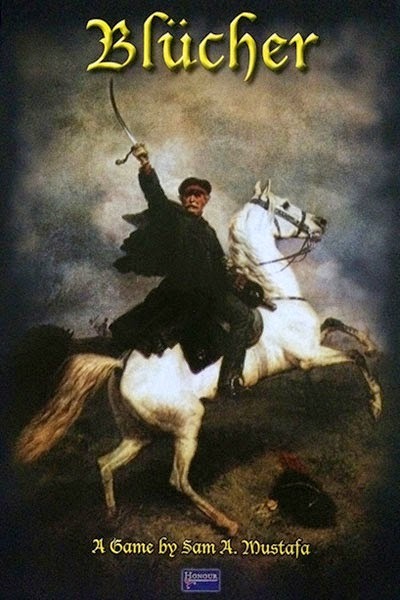 I have often mentioned my fondness for the 1815 Waterloo campaign and how my interest - despite a lull in the early 1980s - has by and large stayed with me since the early 1970s. I have amassed a modest library devoted to various aspects of the campaign and represents a selection of titles both old and new. I will post later about the contents of the library but for now I wanted to share with you the latest arrival to the man cave in the shape of the book you see above. Back in the early 1970s my Napoleonic interest was fueled by a combination of the 20mm Airfix plastic figures, A Near Run Thing by David Howarth and the Airfix Magazine Guide on the subject by Bruce Quarrie. I should also add in Charge and the two Funcken titles but for 1815 the book above was a godsend. My copy was a paperback version and to my knowledge I have gone through no less than three copies as it was notoriously badly bound and would disintegrate after repeated use. I knew there was a hardback version but my teenage finances would not run to the £4.50 - I would have rather purchased boxes of Airfix figures instead! Ugo Pericoli was responsible for the uniforms for the film Waterloo and essentially the book is almost a guide to the battle with lots of full page uniform plates. It is rather like a Blandford title although I prefer this to their Uniforms of Waterloo - if only because the full colour plates are so inspiring. I was absolutely delighted to have secured a hardback version of this book and so the early section of my 1815 library is now complete. As usual it has been busy at work and also over the last weekend but whilst the wargames have had to take a back seat the time has been productive in other ways. My daughter Holly has finally settled on the University she will be going to in September - there were only two in the UK that run the combined honours degree she wants to study - and so after a day long visit to Canterbury and much discussion she has settled on Reading. I am delighted for her as whilst Canterbury is easier to get to Reading is far better for her needs. She demonstrated an impressive rationale for her choice and had obviously researched the campus and facilities in great detail - her maturity and focus around her decision were sources of much parental pride I don't mind saying! On the gaming side I have achieved little other than to catch up on some reading and to work my way through the World at War on BBC IPlayer. I am really enjoying this series and it is making the daily commute almost a joy to undertake! One thing I have arranged though is to visit the Navwar shop at Seven Kings (around 30 minutes from me) this coming Saturday to pick up a few bits and pieces. I am after some additional 1/1200th ancient warships to finish off the Salamis collection although I may add some additional Roman types for the Civil War. I also want to take a look at some of the Naismith 15mm figures for a couple of Blucher inspired ideas I am flirting with. My previous post seemed to strike a chord with many gamers so I felt obliged to expand a little on my thoughts around the whole painting subject. If I am honest this is more about what has inspired me in a deep-rooted fundamental way and how this has influenced my thoughts around painting figures. Think of Little Wars. Think of all those Britains figures marching across countless battlefields to engage the enemy. Think of the sheer thrill of seeing these glossy metal warriors marching or charging to glory across the battlefields of the world - from the cockpit of Europe to the sand-blasted oasis of the desert to the dusty plains and crags of the North West Frontier. The figures are basic - even crude - in detail, flat painted with no shading and gloss varnished. BUT they are quintessentially soldiers - straight of back and steely of resolve. I would challenge any wargamer seeing such a spectacle not being inspired in some way! My first painted efforts all those years ago were modelled on the techniques used on the old Britains figures and this style is optimised for speed above all. The quality of the figures lent themselves to such an approach as they were pretty basic in respect of detail. I am of the opinion that such a style can be readily used on modern figures - especially if those figures are also fairly basic in terms of detail. Simply put, a state of the art ultra detailed model that is sculpted to within an inch of its metal or plastic life would not suit being painted in such a fashion - it would look plain wrong because if the detail is there then it should be painted. "Basic figures = basic paint job" and "Detailed figures = detailed paint job". By a strange coincidence the era that one typically associates with the old toy soldier style of model and paint job is of course the late Victorian or from 1850 to the Great War - which happens to be a period that has taken up a lot of my recent gaming time. The biggest problem I have ever had in my entire wargames career is painting. I am not a fast painter and I also do not get as much time to devote to this as I would like - actually that is not strictly accurate - I do not enjoy painting so having more time to paint would not really work for me! If I am honest I think that the issue is one of perception. You see all these nice models that are beautifully sculpted and artistically painted with tectured and flocked bases and you somehow feel inferior unless you are not churning out the same quality in an army of some 500 28mm models. It is like seeing people in the car park stepping into their Ferrari whilst you are wrestling with a 25 year old Datsun (that is Nissan for who are too young to remember Datsun). I am in awe of these people and probably envious as well. My first efforts at painting figures were very much in the 'flat colour and gloss varnish' school - and I am really pleased that this technique still has its adherents. I have seen many examples of gamers that still use this technique and their games still look as challenging and as exciting and, more importantly, are more readily attainable to us artistically chellenged mortals. If I am honest I have been mulling over this issue for some time and again, if I am honest, I am thinking that using a simple flat style with gloss varnish on plain and unflocked bases will enable me to be able produce armies rather than torturing myself over what I feel I should be producing. As the meerkat once said...."Simples". I readily confess to having had my curiosity aroused when the above was first advertised across the wargames world - especially as the first expansion was devoted to the 100 Days campaign of 1815 of which my ongoing and longstanding interest is well known. So having absorbed a certain amount of positive vibes over the previous weeks I decided to take the plunge and acquired both items. about fighting large scale battles set in the Napoleonic wars - either as a one off games or as part of a campaign using the Scharnhorst system included. Both the tactical and the strategic games are simple to execute yet contain the all important flavour so important in games at this scale. I am really taken with the way that special abilities - unit traits in the rules - enhance the flavour of units to give that all important degree of national and type personality. Although the scale is very much army level having this degree of 'personalisation' adds to the fun and makes relating to your chosen army that much easier - one would expect for example, Russian line infantry to be stolid under fire and so they are in the rules. Am I going to use this solely for Napoleonics? Nah, of course not! I reckon that without too much work the core system could easily be extended both back and forwards to include some of the 18th century as well the 19th up to the dawn of the machine gun and magazine rifle. My thoughts are even wandering in the 'imagi-nation' direction - which is probably no surprise either! Plenty to think about then - and I am sure to be doing so! 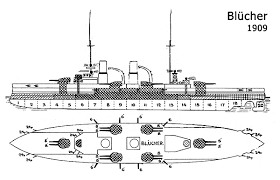 The second of my Bluchers refers to the ill-fated armoured cruiser the German Navy had in the Great War. She was armed in response to the Royal Navy allegedly building their equivalent ships with a 9.2" main gun. The Germans decided to use their own 8.2" which was better only for the first British ships - the Invincible class - to to discover that the Royal Navy ships were to be armed with 12" guns. As it was too late to redesign the ship (and the funds were not available to do so) it was built anyway. I read somewhere that she was even planned to go to the Mediterranean as the German representative in place of a battle cruiser. One wonders how things would have turned out had she been on station when war broke out instead of the Goeben. 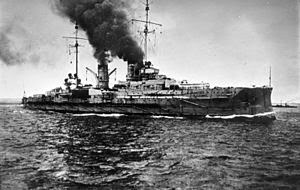 I was always rather fond of the Blucher as she was not a bad ship as such - it was just that she was a good armoured cruiser but less of a battle cruiser. She was sunk at Dogger Bank in 1915 and as this is the centenary year I rather fancied trying out a re fight of the action - if only to give my 1/2400th ships a run out with the rules I am planning to use for the Jutland re fight next year. I have a Panzerschiffe casting of the Blucher undercoated and on the paint tray along with a couple of other ships for the Germans so will aim to get these finished over the next week or so.